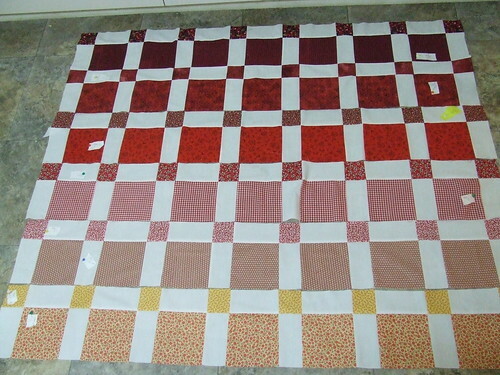 The red and yellow disappearing nine patch quilt I am making is finally coming together. In this case, I wanted certain colors in defined places. With the disappearing nine patch pattern, one usually makes a large nine-patch block (3 blocks by 3 blocks) and makes a cut horizontally & vertically through the middle blocks. Since I wanted particular placement of colors, I cut each one to start and worked row by row according to my diagram. Tho at times I didn’t look at it. 😀 First small issue: in my zeal to finish, I had sewn every print block to a white rectangle in pairs, except the 3″ block rows have a block at each end, and the large block rows have a white rectangle at each end. So the other night, I had to unpick a white rectangle off the end of the smaller block rows and sew it on to the bigger ones. If you look closely at the picture, you’ll see a ripple on the larger row with the red & white gingham. I hate that fabric. It has a higher polyester count, I am sure, and it slippery and prone to ravel. Because of that, my seams are off in this row and it is about a half inch longer than it should be. I’m being extra careful to match seams when I sew rows together, so this will take some easing when I sew it to the next row. The spray starch helps, but it can’t fix everything. In the pic above, most of the rows have been paired. There are six more rows on my work table waiting to be assembled this weekend. Ron also pointed out one row where I used a directional print, and half of the blocks go one way with the rest of them going another way. Small tiny issue, yes. This one doesn’t bug me. (much.) Otherwise, that’s it. There’s no complicated sewing, just straight seams. The small blocks are 3″, the large ones 6″ and the rectangles 3×6″. Cutting was extremely easy as those are the widths of my rulers. The takeaway lesson here I realized last night when seeing how it all came together and where some fabrics were placed. There were some fabrics I had limited amounts of, and because of this, placed them in smaller rows instead of a larger one – a row which would have made a better transition of color to the next row. So: when planning a quilt with prints in particular places, don’t constrain yourself with fabric amounts. Get more. 😀 Substitute if you have to. when I planned the quilt. I took a while with it because I really had to think about the fabrics and the placement. Just restating that more fabric in some prints would have helped. For the curious, a fat quarter was more than enough. I just has scraps of some and tried to squeeze out what I could. Did you ever wonder about some aspects of blogging? Like what it would be like when your children read your archives? But part of it has been a conscious awareness of the permanent state of the internet. The once you put it out there you can’t take it back part. The selectiveness of what is said. Of course, I don’t mention the dust elephants in the corner (I wish I were exaggerating) or the fact I rarely get fully dressed before noon, and sometimes not even after that, or I have to sometimes upload pictures carefully so you can’t tell that emma did actually wear that shirt 3 days in a row. huh. It’s a mental sifting. Twitter is my brain dump and customer service – my work at home water cooler. My blog is my brain’s archive of my life. It is curious, this last child of mine. Her life is entirely documented (well, mostly) online. And while I am reading new articles cropping up at this being the norm for today’s parent, I still remember the small crowd of us starting out. I think of it being ten years this July since my grandmother died and I still haven’t uploaded those entries. They were when I hand-coded the pages. Maybe this year it’s time. I think of seeing Isabella on the webcam, when it’s too snowy to drive down to see them yesterday, of Addison saying my last blog entry was cute, and it meant it sincerely not sarcastically. I think of Christmastime, showing Kaytlyn copies of my grandmother’s daily diaries. “Andrea up for Christmas,” it says. I spent my first Christmas at my grandmother’s house. My granddaughter did too. I think maybe my blog is quite a lot like my grandmother’s diaries. Except not in boxes. I did quilt a little today. Finished off one the other day, stuck a label on it. Couldn’t find the label I have that were Nanny’s, but I will. And I will take a picture of them together. This climbing a mountain and turning around is very circle of life, and I am mixing my metaphors now. People keep asking me how I get all this sewing done. Even the other quilting ladies. Actually, this is my only hobby right now. I haven’t even really taken very many (non-quilt) pictures. I don’t go on photo hunts, I cleaned out a lot of my scrap booking stuff and I barely watch tv. If I do, it’s usually online. Yeah, I gave up housework, too. 😉 A looong time ago… ANYWAY! My home office is at one end of my house and the ktichen is at the other end. Far enough away that I cannot hear the timer on the stove. even from the old office, I couldn’t hear it. Ron sometimes could, but I could not. So, after a few burning dinners or running up & down staircases multiple times in five minute increments, I decided to just stay downstairs for however long it took me to reheat or cook whatever we had. My sewing machine is set up in a room downstairs in the middle of the house. Just a few steps through a small hallway and I’m back in the kitchen, actually. The sewing machine is always plugged in and I can leave my work in a second. There’s always something to work on, and I just grab whatever is on top of the pile. I sew and sew, with a lot of chain piecing. that’s just pushing in one seam after another without cutting threads between them. I sew whatever seams I need to as long as they do not cross. I use all white thread. If i do need to use another color, I will plan multiple projects of just those colors. Sometimes I will spend my time cutting instead. That’s how I wind up with ten quilts cut out though. Sometimes I will iron instead. I don’t have a dedicated ironing station, so I’ve been using the kitchen counter for smaller ironing. For larger pieces, I either do it down at the quilt shop where she has custom boards, or I use the dining room table. I’ll do a couple of items at once then. Right now I am still sewing that red & yellow quilt. I’m piecing each row together in stages, usually chain piecing two rows at a time, cutting sewn section apart from each other as they come out the back, and lining them up for the next seam to go through the front. I think there’s a piece halfway through the machine if I go look now. I usually start supper, get to a spot where I don’t have to stir anything, set the timer & go sew. Maybe it’s five mintues, maybe it’s ten. Sometimes it’s two. I do two meals a day, and sometimes if I am really tired of sitting in font of the computer, I will go downstairs and sew for a bit instead. Half a hour maybe. Or iron as I puzzle something out and figure out how to phrase a support questions without sounding condescending or frustrated. One tough Monday, everyone had communication issues, so I went and sewed every time I wanted to scream at the computer. I got a lot of sewing done that day. Since I work on multiple projects at the same time, there’s often only a few steps needed for each one to reach completion, so it looks like I finished a whole bunch of things at once. A lot of the recent quilts I’ve finished, I actually cut the pieces out two or more years ago. I just told myself I needed to finish the tops before I cut out any more, and that’s been my motivation. Of course, now I have a large pile of quilt tops to quilt, instead of a large pile of cut blocks to sew, but that’s a different problem. Right? At any rate, my point is just something like ten mintues twice a day at the machine adds up by the end of the week. It’s all straight sewing, nothing fancy. I was at the quilt shop sewing this afternoon. Chattering back and forth with the ladies there. It was normal everyday conversation. This time last year, I woudl have been odd one out. Now I am part of the secret club. The knowing smile, the crinkles at the corners of our eyes, and the slight nodding of the head. Yep. Room full of grandmas. I didn’t post for the whole month of June? I am not entirely sure how that happened…. Sure, we did stuff. Sure, I work a lot. Often, there’s just stuff I can’t write about publicly, so it dries up words for anything else. Also, I like sleeping. Anyway! Something I can tell you now. I am co-authoring a book. Yes, it is about WordPress. Yes, it is from a “real”publisher. – Michale Torbert – Developer of the WordPress All In One SEO plugin and owner of Semperfi Web Design. – Cory Miller – Owner and founder of iThemes Media, Plugin Buddy and WebDesign.com. – Lisa Sabin-Wilson – Author of WordPress For Dummies and BuddyPress For Dummies, owner and creative designer at E.Webscapes and co-owner of BA Hosting. So between that, regular client work, writing help text in WP 3.0, writing in the codex, helping in the forums, and managing our own support forums, some days I am out of words. Even pictures are scanty. Can’t remember the last thing I sewed. I has deadlines. Here’s hoping you hear from me in August. Meanwhile, there’s always twitter. – think about women in open source and try to formulate intelligent opinions. I mean, I have them, just hoping to articulate them. you’ll note sleep is not on that list.